My four year old daughter has not nursed since before Christmas, so I think our breastfeeding journey has ended. That's the thing with natural term breastfeeding: the end is so gentle that you hardly notice it at all. It's a bit like growing, you don't notice it until you realise that the sleeves on that jumper you bought last autumn for them to 'grow into' are suddenly ending near the elbows. And you definitely didn't put it in the wrong wash. When I first had children, I never set out to be one of those crunchy, hippy mummies. I honestly thought that breastfeeding was only for the first six months before you graduated onto bottles and solid food. I fed my eldest for a year, which I thought was quite long enough. But by the time my second came along I'd met some really inspirational mums who just carried on nursing. And I read a bit more about the benefits of breastfeeding. Somehow, it seemed right to see what would happen if we followed the self-weaning journey. Don't get me wrong, my eldest was very independent and our weaning journey was very easy and simple. As soon as I started him on solid food he very quickly dropped most of his nursing sessions and when I went away for the weekend just before his first birthday he just never asked to nurse again. But my daughter was different. She latched straight on as soon as she was born and loved the comfort and nourishment she got from the breast. If I ever went away for a night or two, she leapt on me as soon as I returned to reconnect through nursing. So I began to investigate the idea of self-weaning because it seemed to be right for us. I just didn't want to force something if she wasn't ready for it. And, to be honest, I was lazy and nursing was easy (see my post about why I'm still breastfeeding through toddlerhood and beyond). Self-weaning, or child-led weaning is when you allow the child to continue to nurse until they decide to stop. Having introduced solids through baby-led weaning, this seemed like a natural next step. When my daughter was 15 months old, I fell pregnant with my third child. I read up on nursing through pregnancy and highly recommend Hillary Flowers' book Adventures in Tandem Nursing. I discovered that many children self-wean during pregnancy as supply drops. Indeed, about halfway through my pregnancy our nursing sessions stopped suddenly and I wondered if this was the end. But I was wary as I had understood that natural-term weaning tends to occur slowly, almost imperceptibly, and this was a very sudden end. Sure enough, ten days later, my daughter showed symptoms of Slapped Cheek/Fifth Disease and resumed her place at the breast. It was not self-weaning, but a nursing strike, possibly brought on by my pregnancy and/or her incubating her illness. When it became apparent that my daughter would continue nursing through the rest of pregnancy, I began preparing her for the arrival of the new baby. I frequently explained that the baby would only be able to have milk and that she would have to share. We role-played with teddies, dolls and plastic dinosaurs. I explained that she would still be able to nurse, but she would need to let baby go first. When my son was born, he latched straight on and my daughter watched in wonder, repeating over and over 'Baby a'n muwk' (Baby having milk). I reassured her that she would be able to nurse after him and she happily waited for her turn. A couple of days later, my milk came in and I told her the new milk was a very special gift from her new baby brother to say thank-you for sharing. She relished the rich, creaminess after months of barely anything and then the sticky colostrum, which made her so thirsty she needed a drink of water after nursing. And she blossomed (her weight gain was almost as impressive as the baby's) - although her nappies were horrific - multiply the sweet smell of newborn nappy by ten and it suddenly smells as though the local farmer has been muck-spreading in your front room! We faced a couple of issues in those early months. One was that my daughter was gorging so much on my milk that she was dropping her intake of solid food. I began to set a few limits. She could not nurse in the hour before a meal, but as long as I reassured her about when we would nurse, she was fairly accepting of the new regime. The other major issue was the night feeds. She was still waking in the night - in fact, she was up more frequently than her infant brother. I struggled to feed them both at the same time while lying down and when they played tag team I would sometimes get through a night having had less than two hours of broken sleep. I was reluctant to night wean, especially when she was adapting to such a big change in her life. But eventually, I needed to do something for my own sanity. So when my son was four months old, I introduced a new rule that there would be no milk after she was in her pyjamas until the morning, when she was dressed. Again, she accepted this pretty well. I made sure that she had some special time with me having milk before getting ready for bed and that I nursed her as soon as she was dressed. I think sticking to my word about when we would nurse really helped the process. Some people say that by not feeding on demand, you are actually contributing to weaning. But, based on my experiences, I suggest that nursing an older baby is a two way relationship and by setting limits, if required, you are helping the nursling develop their independence and you are also showing them that sometimes you need boundaries and to respect the other person to enable a relationship to thrive. I tandem nursed for two years before falling pregnant with my fourth baby (due at the end of March). This has been my hardest pregnancy yet. Possibly because I'm older and possibly because nursing two children while developing another in my uterus is exhausting work. My daughter started school at the end of my first trimester. It was a month after her fourth birthday. It was a big change for her and she finds the day very tiring (she was still taking a 1-2 hour nap in the middle of the day right up until she started). I believe that nursing helped her settle in to her new surroundings. She enjoyed reconnecting after her busy day and I think the extra immunity she was getting from me helped her escape most (but not all) of the bugs that were spreading through the class. 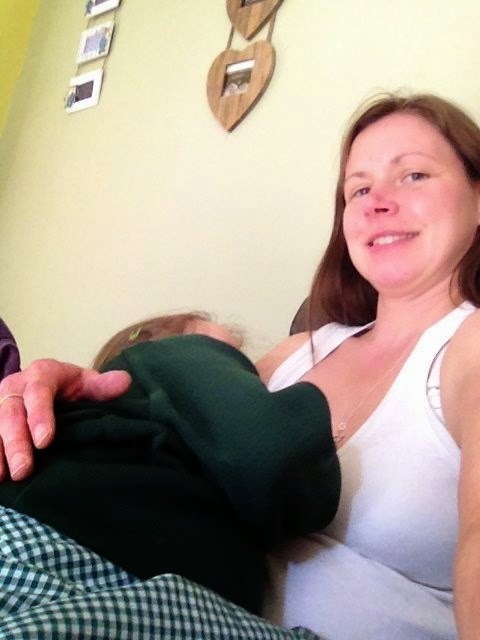 Towards the end of her first term at school, as she grew in confidence and independence, she slowly but surely began cutting back on breastfeeding. Sometimes she'd skip a day, sometimes two days. Eventually, she would occasionally skip a week or two. She was too busy doing other things; playing in her room, drawing, colouring, learning to read, making cards etc. And I knew my supply had dropped because of the pregnancy. But I barely noticed that we weren't nursing as much until, at the beginning of December, I said to her that I couldn't remember the last time we nursed. I asked if she had finished and she said that she had. But that night, she asked to nurse again. She latched on for about 30 seconds before telling me she had finished. I asked if she had got any milk out and she said no. She asked a couple of times after then. Sometimes at bedtime she would request to nurse and I would tell her that I needed to deal with her younger brother but would come back. When I did return to her room, she would already be asleep. Suddenly, it was the new year and as we came into February, I realised that we had not nursed since around Christmas time. Our beautiful journey is over and I am enjoying watching my daughter continue to grow and develop. Some people talk about feeling sad when they finish breastfeeding. But, to be honest, I don't. I'm happy and content with how it all worked out. And, to be honest, I'm a little relieved as I had been suffering with a bit of nursing aversion, due to the pregnancy, over our last few months. I just think we were both ready to end our breastfeeding journey. Purists might suggest that this wasn't true natural term nursing. External factors, such as my pregnancy and her starting school contributed to her weaning. But do you know what? Every journey and every nursing relationship is different. You just do what you believe is right for you and your child and your circumstances. I'm passionate about breastfeeding. I trained as a peer supporter to try and offer support and guidance to other mums as they start their journeys. But I'm also a realist. There were times when I was working and hadn't expressed enough milk to last a day at childcare - so I popped in a couple of cartons of formula - I could have beaten myself up about that, but actually, it would only be me that suffered. You just do what's right for you and your family. I've put this personal story out there because I wanted to share my experiences. I often wondered what sustained breastfeeding looked like or felt like. I had no idea what to expect as our nursing journey came to an end. It's such a gradual process, that people don't think to share their stories. I really hope that this is helpful to somebody. I'd love to hear others' personal accounts - perhaps it would make a beautiful book. If you are happy to share your stories, feel free to get in touch or comment on this post. Thank you, this was really helpful to me. I had wondered how a natural ending would come to nursing.